Hello bunnies! Do you have weird dreams? Do you even remember your dreams? I dream VERY vividly, but I never really have the dreams where I’m flying or doing cool things. Most of my dreams seem to be the kind where I’m back in school and I keep thinking, “But I graduated!” But I stick around anyway because, hey, why not? *laughs* I kind of wish I had the cool, jumping off bridges to fly dreams that some people have. Have you been out to Collabor88 yet? This current round is over in a few days, so you better hurry! I popped on out there tonight and got the pretty Shirt Dress by Bueno, the You Send Me hair by Exile, and a pack of awesome poses called Dreaming by Imeka! I hope everyone has a wonderful start to their week! Happy Saturday, bunnies! If you keep up with my on my personal SL blog, you already know this. But if you don’t know, my sim is changing! After almost 7 years of me renting parcels out, I’ve rented basically the whole sim out to my sister and now we’re all together! She is an amazing sim designer, so it’s been awesome checking out all her work so far. I just threw together a quick weekend look today, a mix of older and newer things in my inventory. Tee*fy is one of my favorite stores for pretty clothes, and I really love the pretty Paige tank top that they have out at Uber. It has extra wide arm holes that dip down to a few inches above the hem, so I’m wearing an applier crop top underneath, but you can’t tell in this pic. The Charlie wedges by Fri.day for N21 are also very cool! They’re just high enough and tie behind the ankle in a pretty bow. I love events that happen occasionally. I mean, don’t get me wrong. I’m down for the monthly events, too. But the ones that come together after a long break are so much fun because no one gets too burnt out on them! Case in point? Festival of Sin II is happening!! Brought to you by The Hottie Cooterati Experience, Festival of Sin is a large event based on all of the 7 “sins.” Gluttony, Wrath, Lust… you know the score. If this is anything like the 2012 event, it’s going to be sensational! Valentina E. is in the Vanity section of the festival and the Pinup Corset Gown is definitely going to make you feel a little vain! I couldn’t stop looking at myself in it! There are four colors to choose from and it comes in standard, Fitmesh, Slink, and Maitreya sizes. Festival of Sin II starts on August 22nd and runs until September 5th. I’ll have much more to show you, plus a SLurl when it’s time! Happy Saturday, bunnies! Just a quick post from me today! Kustom9 and Collabor88 are going strong, so if you have the urge to shop, those are definitely two of the events you should hit up. Hello, bunnies, and happy August!! I got back from my vacation on Saturday night and I think I need a vacation to recover from it! Isn’t that always the way? Unfortunately, it wasn’t QUITE as relaxing as I hoped [and wayyyy more hot than I anticipated!] so I’m definitely enjoying some peace and quiet in SL today. What Next is at Collabor88 this month with the cutest thing! The Lisbeth Garden Blanket is just super adorable for sitting outside. Or inside, if that’s how you roll! You don’t have to use all the props and lights, and the blanket/pillows have 5 different textures to choose from. There are several sits for both singles and couples, too. 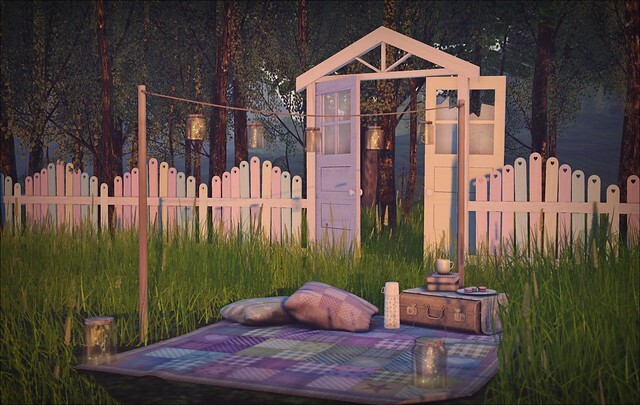 I missed The Neighborhood sale on the 8th, but Leila’s Garden Gates by Windsong are an in store release that are very affordable [landscaping items can get pricy!] and also just darling! There are different colors/prints to choose from.